Flying with a disability can be a nightmare — and not just because of the usual logistics of navigating the world. For wheelchair users, there’s a very real risk the airline will damage, destroy or lose a wheelchair during travel. And that’s something wheelchair users liken to someone losing their legs. 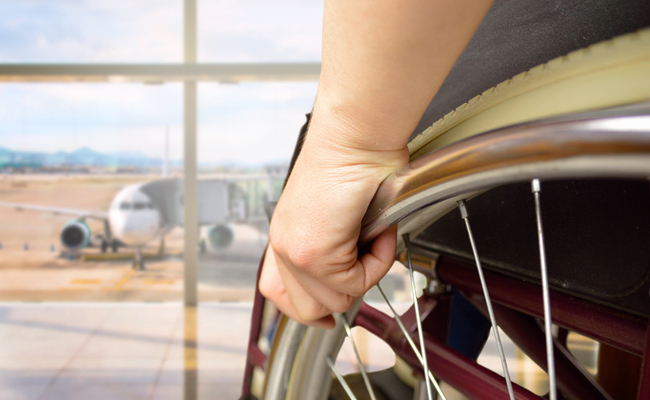 Although people with disabilities have always known anecdotally that airlines routinely damage wheelchairs and other mobility equipment, until very recently airlines weren’t required to track and disclose wheelchair-related issues. Now, the numbers on that mandatory reporting are finally starting to roll in, and they do not look good for airlines. In December 2018, an average of 26 wheelchairs a day were lost, damaged or broken — including, somewhat ironically, Duckworth’s (again — twice). Skywest and Delta performed the best, while Southwest and American Airlines did quite poorly. But Envoy Air, which mishandled almost 15 percent of wheelchairs entrusted to its care, was far worse than everyone else. If you haven’t traveled with a wheelchair, you may be only peripherally familiar with the logistics of wheelchair travel in airports. Aircraft cannot accommodate manual or power chairs in the main cabin, so wheelchair users have to transfer to a specially designed aisle chair to get on board. Their personal wheelchairs are loaded with the cargo. If they are not secured properly or stacked among luggage and equipment, they can be damaged in flight. And that’s when they make it onto the plane at all — and when the airplane doesn’t accidentally give someone’s chair to a different person (which almost happened to me last year in Detroit). While passengers sometimes complain when people with disabilities board first, it’s because the logistics of getting settled can be complex. And once seated, people may not be able to get up (say, to use the restroom) until the end of the flight, when the airline (hopefully) has someone waiting with an aisle chair to help them off. If a wheelchair has been broken or damaged, the airline may provide a loaner. But these chairs are clunky, not fitted to the body of the user and hard to get around in. Imagine being handed a pair of shoes that’s hard, unpleasant and two sizes too small to wear. Having access to data on real-time performance can help passengers with disabilities make informed decisions about which airlines they choose. And it can serve as a shaming tool for airlines, putting them on notice that they need to improve handling procedures to protect these precious belongings. In case you’re wondering, it’s hard to make a direct comparison with lost luggage because of differences in how these data are collected. But people with disabilities would stress that their wheelchairs aren’t luggage any more than pets are — and that they deserve special handling because airlines require them to go in the hold. I mean, don't they think -- this wheelchair here means someone _there_ has none? I just have to wonder, when they misplace the wheelchairs, what do they DO with them? Just shrug and leave them at the airport? As a disabled person I don't even know what to say. I assumed wheelchairs were treated better with the understanding that this is the way someone has to get around. After some of the news stories of the horrors of flying disabled and now this I don't think I will fly. I've even seen a vlog where it took 30 minutes for the crew to bring a man his powerchair after a flight. "While passengers sometimes complain when people with disabilities board first, itâs because the logistics of getting settled can be complex." Calling subhumans passengers is like saying cats and dogs are really the same species. 26 lost or damaged per day. Is there an industry anywhere that provides worse customer service than airlines? Ever?